When you cannot decide which nail color to wear with a particular dress, go for colorful manicure. What can be better than colored nail art studs? You can wear them with any dress, any color and on any occasion. Born Pretty Store has been my favorite when it comes to nail arts and makeup brushes. Today I am going to review Born Pretty Store 10pcs Colorful Oval Patterned Metallic Studs. 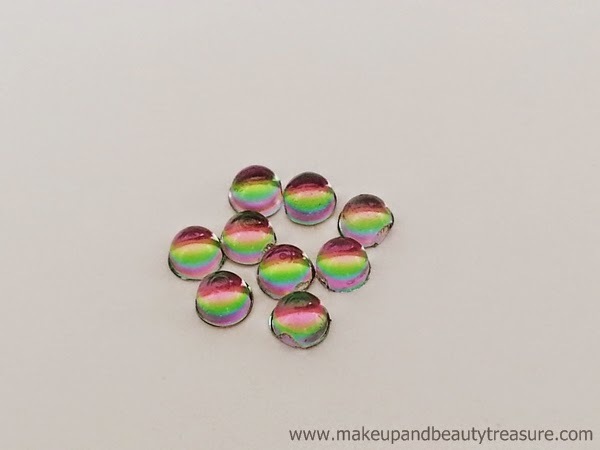 Born Pretty Store 10pcs Colorful Oval Patterned Metallic Stud comes in a clear plastic re-sealable case that in turn is attached to a thick sheet. All the instructions are written at the back of the sheet. The studs look colorful when light reflects on them. They are made from alloy with 2mm diameter. The front of the studs are slightly oval and you can see different colors from different angles. The back of the studs are flat. The flat base allows them to adhere on the base polish easily. They are easy to apply and look really pretty and elegant on nails. The pack contains 10 pieces of metallic studs. The studs are easy to hold and do not tend to stick to each other. 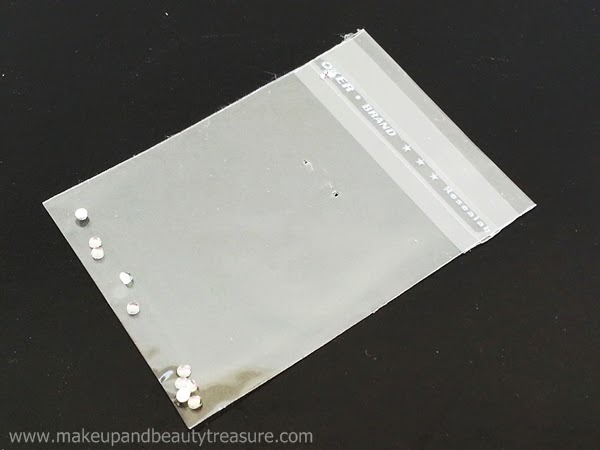 Although these studs are small in size, they are really easy to apply on nails. I make sure to apply a top coat over my base coat and apply these oval studs lightly on my nails on the desired position using a wet tip orange stick. I also make sure to seal the studs with a top coat to make them last longer. I also use it with nail art glue and it really lasts longer than applying the top coat. I simply pour a drop of glue on my nails where I want to place the stud and put and press it lightly on my nails using orange stick. 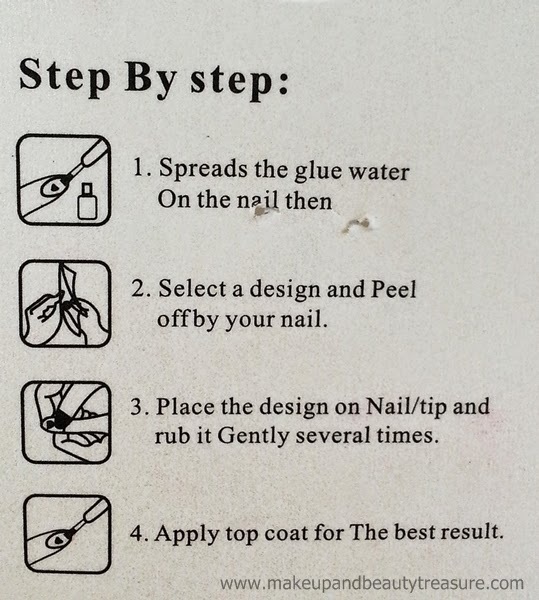 I really do not feel the need to seal it with a top coat when using nail art glue. The colorful oval studs last on my nails for a good 3-4 days with glue and around 2 days with a top coat without losing (I do not do household chores!). They look really colorful, pretty and elegant on my nails. They do not lose their luster and feels really light on my nails as if I have nothing on. You can create many designs using these studs. I created nail art using these studs on Born Pretty Store Golden 3D stickers and wow these studs look prettier. 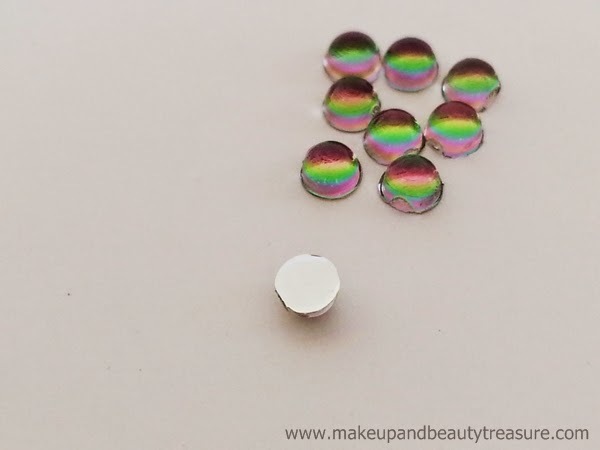 It would also look pretty when you apply these colorful oval studs over black nail polish. If you are a bride to be, I would suggest you to check it out. I am definitely going to use these pretty colorful studs on my engagement. 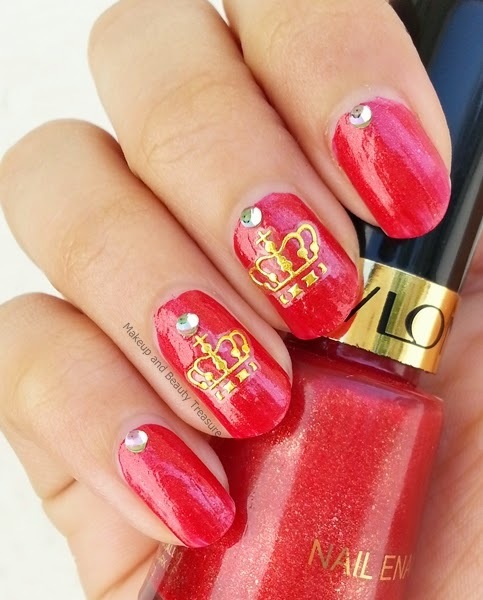 On my nail art below, I have used Revlon Nail Polish in Get Reddy (Read review HERE) as base polish and then applied crown stickers from Born Pretty Store Golden Stickers pack (Read review HERE) on middle and ring fingers. I then used the nail art glue and applied studs over the top of the crowns. 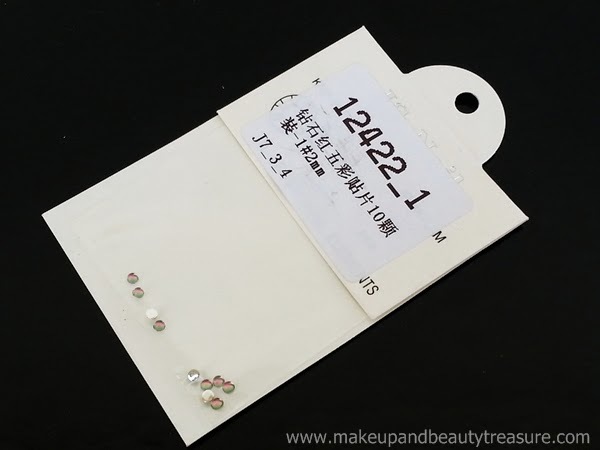 The studs can also be used to decorate cell phone case, cards, body arts etc. • Easy to hold and work with. 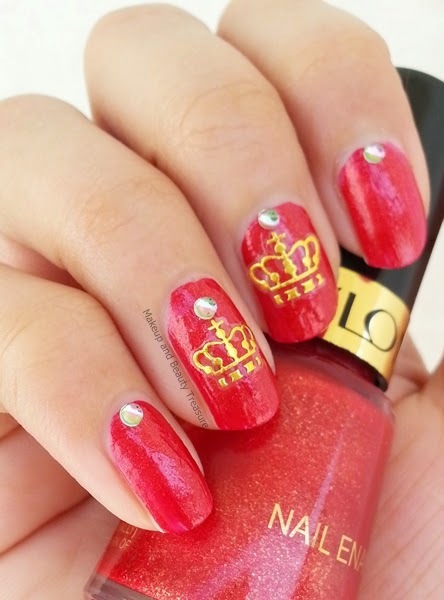 • Looks pretty and elegant on nails. • Born Pretty Store provides worldwide shipping. I totally loved Born Pretty Store 10pcs Colorful Oval Patterned Metallic Studs. They are quite light and are easy to work with. I love applying them with glue to ensure they last on my nails for a long time. They look colorful, pretty and elegant on my nails. You do not need to be an expert in working with these studs. I would definitely recommend it to everyone! Have you tried Born Pretty Store 10pcs Colorful Oval Patterned Metallic Stud? How was your experience? Share in the comments section below!